We’re constantly told how sleep is incredibly important. But worrying about getting enough consistent sleep can cause problems too. “Orthosomnia” is when people obsess over what their sleep tracking apps tell them, and it can lead to even worse sleep as a result. Wearable technology is great in some ways. It’s fun to see how many steps you’ve taken in a single day, and it can be useful to track your sleeping pattern. But apps that do the latter may be causing more harm than good. 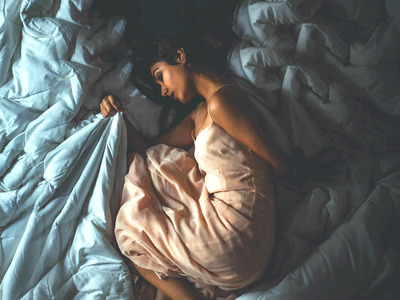 According to a new study, published in the Journal of Clinical Sleep Medicine, people are obsessing over whether they’re getting a good night’s sleep, and it’s causing the development of a new disorder. The sleep disorder has been called “Orthosomnia,” derived from “ortho” meaning to correct, and “somnia” meaning sleep. It has particularly affected people who use Fitbits or apps to track their sleep, like Sleep Cycle. The researchers say in the paper that people are becoming concerned about getting the perfect night’s sleep – and it’s stopping them from actually getting it. They likened it to orthorexia, which is the unhealthy preoccupation with eating healthily, to the point that it’s actually unhealthy. The issue with sleep trackers arises when people rely on them completely. When their sleep data isn’t perfect, they end up diagnosing themselves with problems. He said he only had these symptoms when his tracker told him he got less than eight hours of sleep the night before. Although his goal was to have eight hours consistently every night, the man would occasionally look at his phone throughout the night to answer texts and emails, and he would work right up until trying to sleep. Sleep scientists are all agreed that screens are terrible for our sleep. The bright lights stop our bodies from producing enough of the hormone melatonin, which makes us feel sleepy. Essentially, the light tricks our body into thinking it’s still day time. That’s why binge watching shows late at night is bad for you, and people struggle to sleep if they turn their laptops and phones off only just before they lie down. In the second case study, a 27-year-old woman complained of Restless Leg Syndrome, and found her sleep efficiency was only 60%, according to a tracker. Rather than relying on how they felt, people in the study seemed to be unable to ignore their trackers. It was unclear whether the patients had real sleep problems before they started using apps, but it is certainly possible that they didn’t help. Life gets in the way of this sometimes, but the advice is to try and wake up at the same time even if you’ve had a late night. It will probably be painful to drag yourself up every day, but you’ll feel the benefits in the long run.